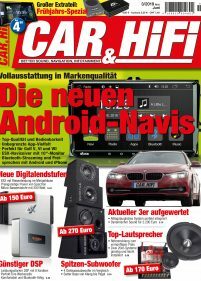 When Car&Hifi was launched in 1990, it was the first magazine in the German-speaking countries to cover mobile audio and electronics. And when in-car-CD was still new, Car&Hifi not only provided audio enthusiasts with the latest reviews, but also offered groundbreaking advice and information on how to achieve the best sonic performance in any car. Car&Hifi was involved in projects like the German Car & Sound audio fair and the European Car Audio Press (ECAP). Always aiming to pick up the latest trends in the market, Car&Hifi made future technologies an inherent part of the magazine by introducing the Car Hitech section in 2000, which extended the magazine’s content to multimedia subjects like DVD and in-car navigation. Now, readers find reviews on products across the whole breadth of in-car entertainment in every issue, as well as in-car installations, DIY stories, car media basics and background information. The magazine’s readers are mostly aged 18-35, are car enthusiasts and can’t live without high-quality mobile entertainment! They spend lots of time and money improving their cars, often with high-end audio installations. Car&Hifi is also read by people looking for sophisticated solutions for everyday car use, from entertainment to communication to navigation. Readers use the magazine both as a buyers’ guide and a source of inspiration.